The PSG database is a crowd-sourced sugar glider pedigree database that goes be. The information collected by breeders and owners is used to work toward our mission. The PSG database is completely free to use, but will be ad supported to help cover the costs of hosting and running the PSG database. We are dependent on the community to help run and maintain the database. If you are interested in being a part of this project, please contact us for more information. Please consider donating to help cover the costs of hosting and maintaining the PSG sugar glider database site. 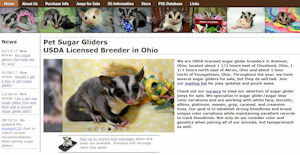 This website is fully crowd-sourced and dependent upon accurate information from sugar glider breeders and owners. By using this site, you understand that the accuracy of the data presented here is not guaranteed. The PSG database uses a team of volunteers to moderate accuracy of information within our system. If you notice an inaccuracy, please notify us immediately with any pertinent information so our team can review the issue. Users that knowingly falsify or provide inaccurate information will be banned from the system. Any major changes that affect the pedigrees of sugar gliders listed on this site will be posted on our corrections page with an explanation of the changes. This site is still under construction. Changes and features are being update almost daily. At this time, ALC and COI calculations are in development and should be completed by the end of the month. We also have a sugar glider adoption system that should be in place very soon. Other pending features include a private messaging system, message board, and active breeder searching. We are open to suggestions to the PSG database. If you have an idea, contact us anytime. You are also encouraged to join our Facebook Group for updates on the PSG database project.